This is from the Free Williamsburg magazine’s October 2010 edition. It is a illustration of Williamsburg’s colorful and contrasting population of hipsters and Hasidim. 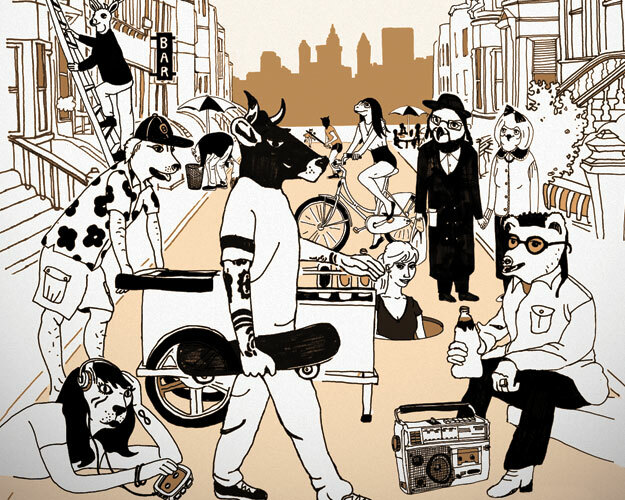 The hipster frog is riding a bike, the lion has his headphones on while his hair is grown in long – channeling some rock music personality, the cow has a lot of tattoos, the girl (not an alligator?) is coming out of the sewer. The Hasidic bear couple is holding hands. As we know, Hasidic couples don’t actually hold hands or express any type of physical affection in public, but if this couple is fraternizing amid this scene, we can’t surmise what they may be up to that run of the mill Hasidic couples would not do. We leave the scandal investigation to other authorities. And note the giant bow on the woman’s wig. That is a fashion catastrophe.